Allergic disease, including asthma, is the fifth leading chronic disease in the U.S. in people of all ages. More than 50 million Americans cope with allergies.1 An allergy occurs when the body’s immune system sees a substance as harmful and overreacts to it. The substances that cause allergic reactions are allergens. Asthma affects almost 24 million Americans.2 It is causes your airways to become inflamed, making it hard to breathe. People with asthma are sensitive to things which may not bother other people. These things are “triggers.” Allergens or irritants are common astha triggers. Triggers can make asthma symptoms worse and cause asthma attacks. Allergens, unlike irritants, cause your body to have an allergic reaction. But exposure to either can increase your risk of asthma symptoms. There is no cure for asthma. The best way to manage asthma is to avoid triggers, take medicines to prevent symptoms and prepare to treat asthma episodes. An important part of managing your asthma and allergies is improve your environment. This means getting rid of, reducing and avoiding triggers around you. This is called environmental control. These are just a few sources of allergens and irritants. We spend most of our time indoors, so it makes sense to focus on making your indoor environments better. And we spend one-third of our lives in our bedroom. This one of the most important areas to make allergy-friendly. Create a plan to reduce indoor allergens and improve your indoor air quality. Use Certified asthma & allergy friendly® allergen barrier bedding. Wash sheets once a week in 130°F water. Never allow pets on your bed. Never allow wet or moist clothing to pile up. Use a Certified asthma & allergy friendly® air cleaner. Replace mattresses every 10 years and pillows every 2 years. Vacuum floors and mattresses weekly. 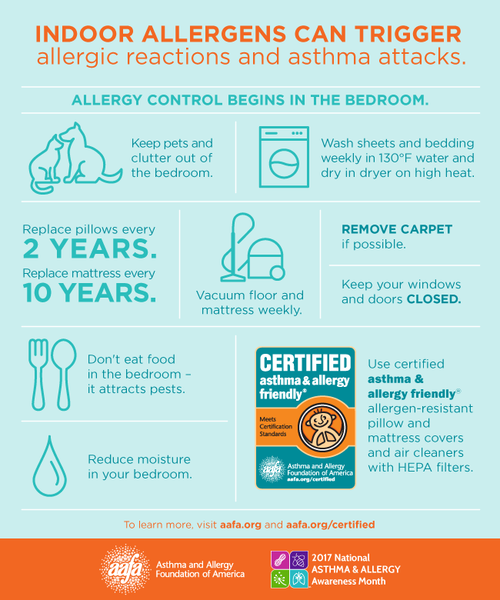 Learn more about indoor allergy control to better manage your asthma and allergies.